Mmm.. vegan chocolate lava cake. It’s gooey, melty, full of rich dark chocolate, and usually the crown jewel of any dessert menu. I mean, who doesn’t want to take a giant spoonful of a cake that oozes delicious melty chocolate? Before making this vegan chocolate lava cake, I hadn’t had it in years. As a teenager I would go to Chili’s every week and order their lava cake. I swear, it barely hit the table before being devoured, plate licked clean. So yeah, I guess you could say I have a thing for chocolate lava cake. But this one, this one, is very special. For starters, it’s vegan! Yay! No eggs, no milk necessary to make this cake taste amazing. I also made it gluten-free so all of my buddies with gluten allergies can indulge. No one gets left out when making vegan chocolate lava cake! Another perk of this vegan chocolate lava cake is that it take less than 30 minutes to prepare, from scratch. If you’re looking for a dessert to impress your family and friends over the holidays, this my friends, is the one. The best part is that you can totally get creative with the filling! The recipe calls for dark chocolate squares, but you could also throw in a little spoonful of peanut butter or a vegan caramel. A spoonful of jam or some vanilla cashew cream would be delightful as well. The possibilities as endless as your imagination! This vegan chocolate lava cake definitely has a spot reserved on my holiday table this year. I’m celebrating with my non-vegan family so I want to make a dessert that will really wow them. 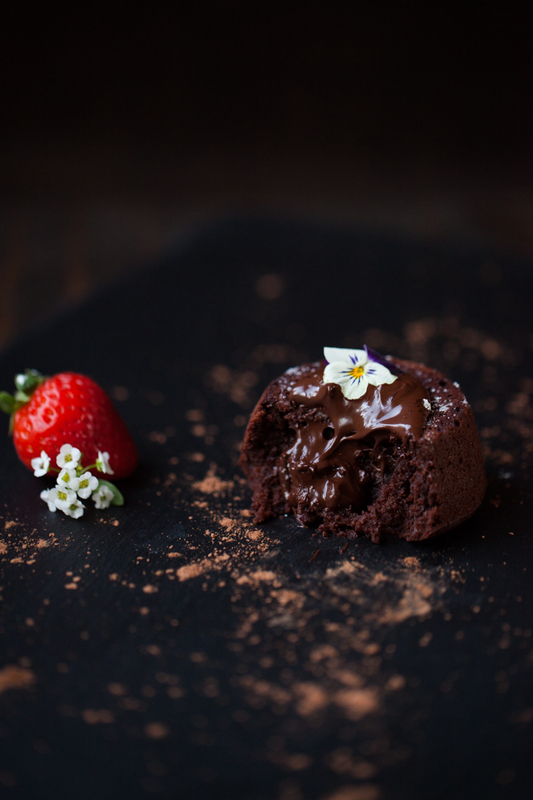 If you make this vegan chocolate lava cake, be sure to rate it in the comments and let us know how yours turned out! While you’re at it, tag a photo with #carrotsandflowers on Instagram so we can admire your baking skills. To save this recipe for later, pin the photo below! Restaurant quality vegan chocolate lava cake that's gluten-free and ready in less than 30 minutes. Rich, luscious, and not too sweet. Preheat the oven to 400F. Grease 6 holes of a muffin pan with a light layer of coconut oil and cocoa powder, then flip it over and gently tap away the excess powder. Add the almond milk and vinegar to a large bowl and stir. Set aside for 5 minutes. Melt the chocolate chips in a saucepan or double boiler over low heat, stirring often. Add the coconut oil, vanilla, sugar, and applesauce to the almond milk and beat with a whisk until the mixture gets frothy. It may be a bit lumpy, especially if the almond milk was cold. Add the cocoa powder, flour, salt, and baking powder. Whisk until the large lumps are gone then stir in ⅓ cup melted chocolate chips, reserving the rest for toppings. Spoon ¼ cup of batter into each of the 6 greased muffin holes. Gently place a square of chocolate (2 if you're feeling fancy!) into the batter and push down slightly. Evenly divide the remaining batter to cover the chocolate pieces. Bake at 400F for 13-17 minutes. You want the outside to be fully cooked and the inside to be gooey and melty. Keep a close eye on the lava cakes after 13 minutes and pull them out when the top of the cakes has a a bit of a sheen but doesn't look completely wet. Let the pan sit for 1-2 minutes, then place a cookie sheet on top of the pan and flip it over to release the lava cakes. Top the cakes with the remaining melted chocolate chips and a light dusting of cocoa powder or powdered sugar. Serve immediately or let cool completely before transferring to the fridge. *Suggested toppings are fresh strawberries, edible flowers, Coconut Whipped Cream and Strawberry Chia Jam. *Cake is best served fresh although it can be reheated in the microwave for 45-60 seconds. *Room temperature almond milk works best for this recipe, but cold is ok too. Just a bit less than 1 cup.. The link to the glutenfree flour doesn’t work for me so what sort of flour do you use? Can almond flour do the trick? And I didn’t saw your answer about using regular flour, would that also work? Sorry about the link! I used Bob’s Redmill All-Purpose Gluten-free Flour but regular All-Purpose wheat flour works just the same. Could I use coconut flour? It would probably give it a different taste huh? I imagine it would change both the flavor and the texture. If you try it, I’d love to know how they turn out! Could I use regular flour? Can I use regular flour? or even whole wheat flour? wil it work? do i need to use the same amount of flour? How do make the apple sauce ? I made these yesterday, these were amazing. I put a banana instead of apple souce, still very yummy. I like that I only got 7 cakes, which was just perfect amount of these rich muffins. So happy to hear you enjoyed them! My oven is VERY annoying. The cakes have been on for over 17 minutes and not cooked! My 6yo is sitting at the oven waiting. Tried this and they were amazing! Very tasty recipe. I like it. Can i have a piece of cake? I’m allergic to almonds. Do you think that soy or coconut milk would work too? Any plant-based milk will do the trick here! can we replace choc squares with choc chips? You’re not suppose to go over 350 degrees when using coconut oil. I just made these! Fantastic! We made them for Valentine’s Day. They were scrumptious!